Please select the area you would like to support below to make your gift today. 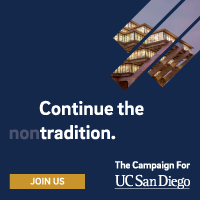 Please note, you will be linked directly to UC San Diego’s online giving site to complete your gift. Provide flexible funds that will meet Scripps' most pressing needs, including support for students, research, campus infrastructure, and faculty. E.W. Scripps Associates is a premier group of annual donors who make a difference in the global research conducted by Scripps Institution of Oceanography scientists. Provide critical funds to support undergraduate students who represent the next generation of ocean, earth, and atmospheric science leaders. Provide critical funds to attract and retain graduate students who represent the next generation of global leaders in environmental science. Support world-class research and exploration that will lead to solving some of our planet's most pressing environmental problems. Help Birch Aquarium at Scripps maintain its extraordinary marine and education exhibits, as well as provide critical funds for future growth. Provide support to maintain one of the largest and most diverse collections of marine samples in the world. Help us grow our collections and share them around the world. Supports Scripps scientists and students through direct investments in the equipment, tools, and resources they need to conduct cutting-edge ocean and earth science research. Learn how private support at UC San Diego is making a difference today. Each gift counts.